Howdy, all! Decided I'd do something a bit different this week. 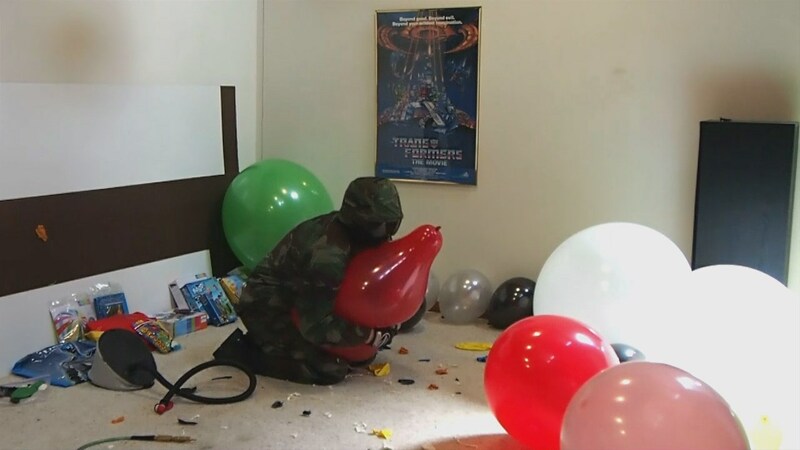 Even though I play with balloons off-camera fairly frequently, they don't end up the focus of my videos on this site nearly as often as they used to. I figured I'd take a break from my marathon of inflatable busting to do a "balloons only" video. Lots of big bangs, lots of pieces flying, and quite a variety of methods of popping, all for your viewing pleasure. The balloons used were Unique 12" (found 4 bags of 72 at a thrift store for $0.50 / ea! ), Tuf-tex 17", and a few Tuf-tex 24". As usual, hope you all enjoy. I definitely enjoyed making it. This entry was posted on Wednesday, June 21st, 2017 at 8:32 pm by Mr. MotoX in the category Videos. + Show - Hide 4 comments on "Toy-A-Week #18: Balloons and BDUs"
Loved it! Can you pop the big beach balls next?? Your demonstration of pure athleticism with those hump busts and the power and strength of those hug busts with all that rubber flying was breathtaking. You are really getting back in shape champ keep destroying those toys. Yeah the balloon popping was great and love you in the BDUs. I was hoping maybe you could do something in your Fox gear next. That would be awesome. Not all sure what you have left though.